Welcome, Tyrians! I’m Roy Cronacher, and today I bring information to you all about the elite specialization for the revenant as well as some details about underwater combat for the profession. Just like the other eight professions, the revenant will receive an elite specialization that contains a new weapon type, a new legend, a specialization line for traits, and a change to the profession’s mechanics. The herald elite specialization brings back a dragon that some of you may be familiar with. Let’s dive into it. The herald elite specialization will offer revenants the shield as an off-hand weapon, a Legendary Dragon Stance, a new specialization line, and an added profession mechanic. The focus of the herald is on support via boons, utility, and personal defense. This elite specialization will pair well with most of the other legends, providing group utility. The legend for Legendary Dragon Stance is Glint. We chose the name herald for this elite specialization because we thought it was fitting given Glint’s actions in the past. In the original Guild Wars®, Glint compiled the Flameseeker Prophecies, foretelling events such as the defeat of Vizier Khilbron as well as the fall of the titans and the mursaat. Much of what she predicted came to pass. She was a protector of Tyria and a herald worth heeding. First we’ll discuss the shield. The shield is primarily a defensive weapon used to help survivability for you and your allies, and its skills provide both healing and boons to help sustain you in the thick of battle. The Glint skills generally provide more benefit when you stay close to fights to aid your allies, so the shield can help complement that playstyle very well. Crystals, energy, and parts of Glint are a visual theme across the shield and utilities. Let’s check out the shield skills. Send the energy of Glint toward the target area, granting protection to allies. The energy will burst, healing allies, and then return to you, granting protection on the way back. This skill can be used for personal benefit, but it also provides great support to allies. Send dragon energy forward from the shield, granting protection to allies as it passes through them. Envoy of Exuberance is a ground-targeted skill, so you have control of the direction of the energy. Once it reaches the target point, it’ll burst with healing energy to heal nearby allies before it returns to the revenant. Channel a shield from the Mists to protect you and regenerate health. You take no damage from attacks, and conditions cannot be applied to you. Unlike Envoy of Exuberance, which is more support focused, this skill is more about personal defense. This is a channeled skill that forms a crystal energy shield around your character, making you immune to damage while quickly regenerating your health. While in this state, your character will have a defiance bar. Since the skill is very strong, its use comes with a higher risk. 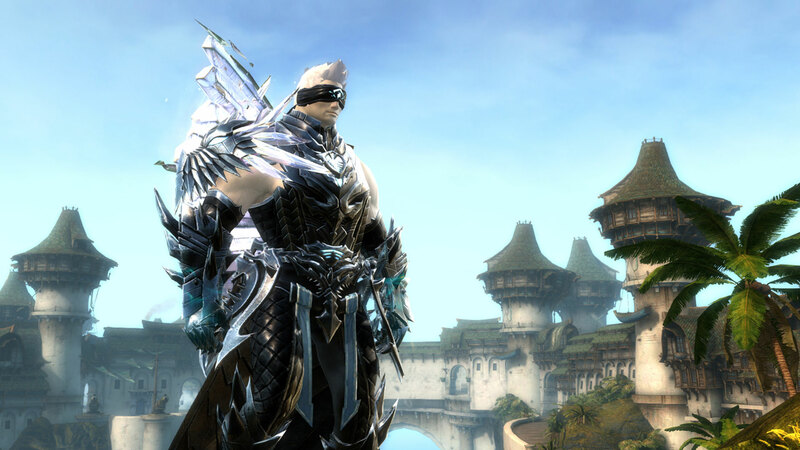 If you played the original Guild Wars or are familiar with it, then you may know a thing or two about Glint and her facets. In the Prophecies® campaign, players had to fight the six facets of Glint before reaching her. We wanted to add all six of the facets to this legend. Each facet is represented as a skill. Glint is all about upkeep skills, which are unique to the revenant profession. They cost energy to keep active, so you’re trading potential energy regeneration, which can prevent you from using other skills. All five skills on the right half of the bar are upkeep skills, as is the added second profession mechanic skill, Facet of Nature, which I’ll explain below. When activated, each facet pulses beneficial effects to nearby allies as long as it’s active. While a facet is active, you’ll gain access to a new skill that you can use to consume the energy of that facet for a more potent skill at the cost of setting both on recharge. Each one of the active skills that consumes the facets is visually represented with different parts of the dragon Glint. Let’s look at some examples. Grant nearby allies swiftness every few seconds. When activated, the Facet of Elements will pulse out swiftness to nearby allies at the price of the upkeep cost of your energy. This is great to have active while traveling or in movement-heavy fights. Consume Facet of Elements to have magical dragon breath cover the target area. This skill represents the breath of Glint. It’s a ground-targeted skill in which you command dragon breath to cover the area, applying negative conditions to foes such as chill, weakness, and burning. It’s good for added damage or soft control. Grant nearby allies protection every few seconds. This facet is the elite skill for herald. As such, it provides a strong boon in the form of protection to nearby allies as long as it’s active, but for a much higher upkeep cost. It also has a stronger effect when consumed. This is great for supporting you and your allies through tough moments in battle when facing immense odds. Consume Facet of Chaos to damage and knock back foes while granting super speed to allies. 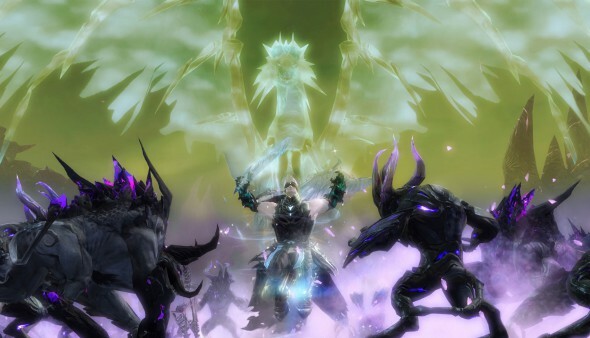 The consume skill for Facet of Chaos was shown originally in the trailer for Guild Wars 2: Heart of Thorns™ when the dragon image gusts its wings over an area. This skill harnesses the power of Glint’s wings to provide a very strong gust, controlling foes and granting allies super speed. 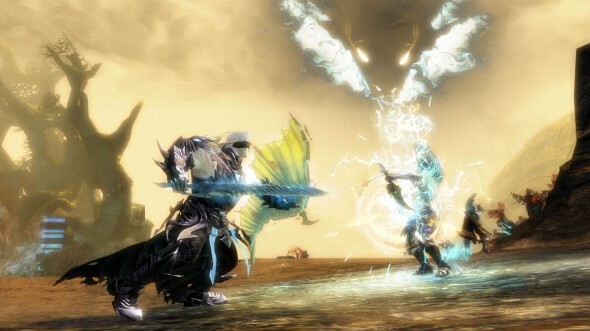 This skill can be used in many different situations such as controlling foes, peeling foes for allies escaping, entering a battle, or even making use of the speed to exit a battle. The heal skill, three utility skills, and the elite skill account for five facets, but there’s still another facet to reach the total of six. Facet of Nature will be a special facet, as it can be used no matter which legend you’re currently invoking. Like the others, it’s an upkeep skill, but it’s designed to tie in with the other five. Pulse Naturalistic Resonance every few seconds to nearby allies, increasing their outgoing boon duration. The other five facets pulse boons to nearby allies, but Facet of Nature is used to boost other facets, allies, or traits and skills you may have equipped. This pulses out a unique effect that increases outgoing boon duration by 50%. Having it active while pulsing out other facets will provide more uptime of the benefits, so even if you switch legends, they’ll still last. This can pair well with other profession builds—a shout guardian, for example. Consume Facet of Nature to unify with the other facets, granting allies the boons the facets provide. Similarly to the Facet of Nature, which ties into the other facets via boosting their effectiveness, this ties into the other facets’ innate powers. One with Nature draws on the strength of all the other facets, so when it’s used, it provides allies a burst of all the boons the facets would normally apply. There’s been some discussion since the revenant test weekend event about underwater combat for the profession. For starters, I’ll be going over some of the spear skills for the revenant. By the next time you get to play, some of the legends will be converted to function underwater as well. For the spear, we took a hybrid approach, making sure to appeal to both physical and condition-damage styles of play. We’ve also tried something a bit new with the weapon to complement this—there are two autoattacks for the first two skill slots of the weapon. Throw a spear from the Mists toward your foe. Inflict increasing durations of torment the farther away your foe is from you. The first of the two autoattacks, this skill is a ranged attack that focuses on condition damage. This skill is great for punishing foes that have to close large gaps in order to reach you. The second of the spear’s autoattacks is a melee attack with a slightly extended range. As you rapidly thrust your spear forward, powers from the Mists extend from each strike. This is primarily a physical attack, but the stacking of vulnerability can be useful to any damage type. Just like having two autoattack skills, some of the other underwater skills are set up to provide a more varied playstyle. Generally the first skill will be more condition focused, and it’ll flip over to a skill focused on physical burst damage. In the next skill, you’ll see an example of that. Venomous Sphere is a condensed sphere of energy from the Mists that you fire out in the direction you’re facing. As it travels, it attacks nearby foes, poisoning them. It’s a great way to add another damaging condition, prevent some healing, and set up for Frigid Discharge. Detonate the sphere, damaging and chilling foes when it explodes. This is the flip-over skill for Venomous Sphere. As the sphere travels outward, you get the option to use Frigid Discharge while it’s active. This skill is a way to surge energy through the sphere, causing it to detonate for a burst of damage. 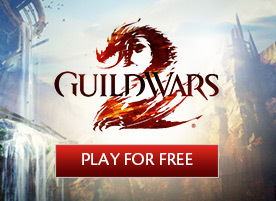 Create two rifts, one above and one below your target. After a short delay, these rifts will create a barrier from the Mists that prevents foes from crossing it. Imagine summoning two unstable rifts from the Mists above and below your target. If foes can’t escape before the rifts connect with each other, they’ll be trapped by the created barrier. This is a great control skill that can be used for kiting or for setting up combinations with the other harpoon skills, such as providing targets for Venomous Sphere and Frigid Discharge. Well, that’s all for today, folks. 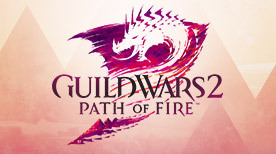 Make sure to check out the upcoming Points of Interest livestream this Friday on the official Guild Wars 2 Twitch channel to see all of the things I discussed today. 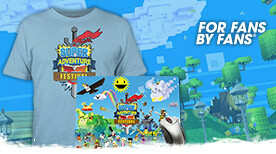 Also be on the lookout for upcoming Beta Weekend Events, where you can try out these things firsthand!